Saturday 3rd May was the 50th running of the Rotorua Marathon. The Rotorua Marathon is one of New Zealand’s longest running marathons with a legendary status for its around the lake 42.2km race. This year being the 50th anniversary attracted some of New Zealand’s best marathoners to the event. This was my second marathon and I had done a great build up leading up to the event over a 14 week period. My previous marathon was June 2013 which was in Wellington. My time in Wellington was 3:25:56. 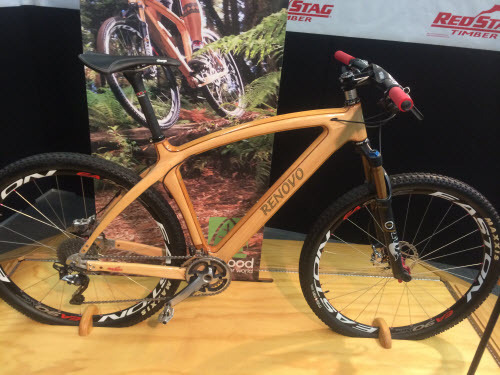 The goal of Rotorua was to better the previous time but I also knew that the Rotorua course was undulating with some hills so there was a bit of doubt in my mind about being able to beat the previous time. During my training build up most of my training runs indicated towards the last 6 weeks that I should be in 3:15-3:20 shape to complete the distance. Then again it would all come down to the day and conditions like any other race. I just had to trust the training I had put in and aim for my goal time. We drove up to Rotorua on Thursday after work. There was a group of us from our running club Wellington Scottish and also my Wellington Running Meetup group who were there for the event. Most were doing the marathon and a few were doing the half marathon. Friday morning we went around to Blue Lake and did an easy lap to loosen up. There are some great running trails in Rotorua so we made the most of it by going for an easy jog/run around the 6km or so lake circuit. Round Lake Tikitapu (Blue Lake) with Gemma, Hinano, Berndon and Dan. Then we headed to the expo hall in the city and got our registration packs and numbers. 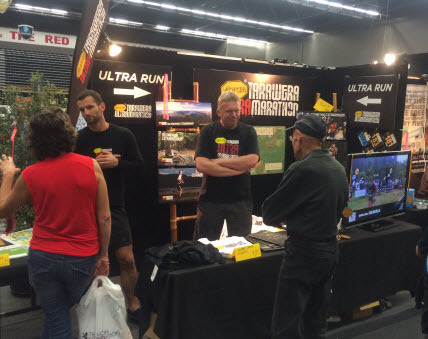 The expo hall was packed with various vendors and the guys from Tarawera Ultramarathon was quite popular. After the expo we walked around the Rotorua township and relaxed in the evening back at the apartment we were staying in. I made a great spaghetti bolognese for the team who were staying with me. Perfect mix of carbs and protein for a marathon. The forecast was for light winds and a high of 17c. Perfect conditions for running. There was a thick fog but hardly any wind early morning. The start was a short drive away so we all got to the start area by 7:15 am and met up with some of the other club runners. The half marathon runners started at 8am (went in the opposite direction for an out and back) and the Marathoners started at 8:20am and ran clockwise around Lake Rotorua to complete the 42.2km distance. The course has an elevation gain of roughly 300m with two minor hills (read undulations) but enough to make you work for it around 20th km and 27km markers. Rotorua Marathon Course. Check it out on Strava. I started with a couple of Wellington Scottish club mates, Bruce and Edwin who were also wanting to run 3hrs 20mins. My plan was to go through the first half of the course conservatively but at a steady effort and then work after around 30kms to get as close as possible to completing in 3:20. The race start was spot on at 8:20am outside the Rotorua Events centre. The first part had a little out and back section where we could see the ‘elite’ runners up ahead then after that it was pretty much whoever was bunched up in packs. The three of us ran through the first 1kms around 4:45 pace then held it steady ranging from 4:35-4:40ish pace up until to around the 10km marker. We also noticed that on my GPS we were roughly about 250-300m off the markers (meaning on the GPS we would hit the 10km marker at 10.3km). As GPS co-ordinates can be notoriously off we didn’t really care about that. Around 10km is a slight uphill and our pace dropped a bit but we were still running pretty easy. So far so good another 32kms to go. Km 11 & 12 were 4:46 and 4:37 then a slight increase in pace on the down hill to about 4:27 before we hit another small up around 14 & 15kms which dropped to 4:50 and 4:40. Still in keeping with a 3:20ish finish. I decided to have a Gel and water at the next station which worked well and managed to actually perfectly grab a cup squeeze the end drink without losing stride. Textbook stuff if I may say so myself! At this stage we caught up to a group of runners in Hamilton City singlets and there was four of them who were keeping a steady pace. Bruce had dropped back a little and Edwin and I decided to stick with the the Hamilton guys for a while and just sat behind them. The next 4kms was the first “hill” basically the course went up and we eased off to run the hill in 4:40, 4:45, 5:07, 4:36 not too bad and that really wasn’t a hill compared to some of the hills in Wellington. Over halfway now and I think we went through in about 1hrs 40min. Coming down the hill Edwin was slightly ahead of me and kept going at a steady pace and I held myself back a little on the downhill but eventually caught up to him on the flat section. 23, 24, and 25th Kms were in 4:22, 4:25 and 4:27 pace. The next 3kms was the next uphill. Basically a long up that gradually rose not as sharp as the last one. I had this slight cramp build up at the last hill and it soon became evident I had to stop at the next toilet! BUGGER!. Anyways I shouted to Edwin that I’m taking a pit stop and he must have thought that would be the last he’ll see of me as he went off. Basically it only cost me like 2-3mins I was in and out and that seemed to cure the cramping. So off I went and I could see that Edwin had gained about a good 600m on me. And there was a big bunch of runners in front of me and Edwin. I increased my pace cautiously knowing very well that the last 10kms of a marathon is the key part of having a good race turn ugly. I could hit steady 4:30 pace and within about 1km or so I was running next to Edwin again and he was a bit surprised to see me there. I was feeling OK to hit 4:30 pace so I kept on running without slowing down. I downed another GEL and water at the next station around 32kms and decided I will take on water at the next as well. Around the 34km marker I had another bout of cramps this time however I decided NOT to stop but run through it, It was painful and actually slowed me almost down to 4:50 pace and I knew that my arbitrary goal of 3hrs 15min finish time was not going to happen. I still felt relatively OK apart from legs starting to hurt and I knew I could still sustain a faster pace. From 36km to 40kms it hurt a lot but I caught up to a group of three runners around the 40km marker and from there gritted my teeth and gave it all I got. The last two Kms were in 4:24 and 4:31 and my final finish time was 3hrs 18mins and 48secs and a new PB. Officially I was the 198th of 3513 total finishers. In my age group 40-44 I was 37th out of 354. A pretty good result given the course elevation etc.Fellow Wellington Scottish and Meetup runners did some amazing times on the course with Dave Parsons of Scottish running a 2:36.51 and earning 6th overall. Michael Wray has a great write up on his blog on how things went at the pointy end. In the women’s field Katie Kemp came third in 2:49:55. Full results are online at the Rotorua Marathon site. Now I am taking a bit of a break but next goal is Berlin Marathon in September 2014. Training starts next week with a 20 week build up broken down into 2 training cycles. Short term goal is to run a faster 10 km and a half marathon PB in the coming 3 months then get into Marathon training targeting Berlin. This entry was posted in Marathon, Races, Running and tagged 2014, competition, Marathon, PB, Rotorua, Running by 74Runner. Bookmark the permalink. Congratulations on your PB and a super race report. So nice to find another kiwi running blogger. I do remember you ahead of me. Those Pegasus 30+ in red really caught my eye. Great shoes. I wore the same that day too but ran 6 minutes slower than you. Mine weren’t red – perhaps that was my problem. Am tossing up whether to run Wellington. The thought of a windy day scares me though. Hi Mark, congrats on your finish. Rotorua is a tough but great course. My club mates tell me that if you run a time in Rotorua you can easily deduct 5mins on a flat course such as Wellington or Christchurch on a non windy day! 🙂 Yes the Pegasus 30s are great. I only started wearing Nikes this year I’ve been a Brooks and Adidas fan but the Pegasus are great for longer distances such as the Marathon. Good luck with your running and hope to meet you in person at an event.